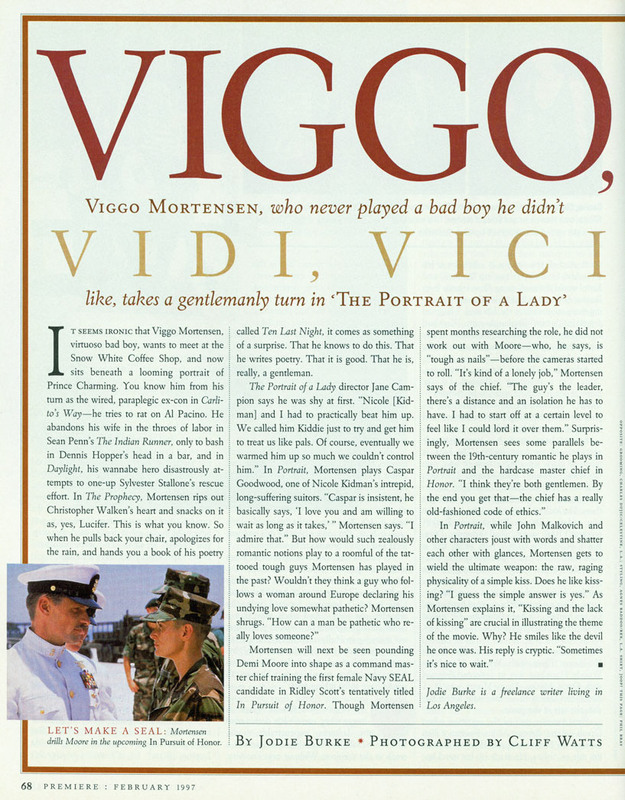 Viggo Mortensen, who never played a bad boy he didn’t like, takes a gentlemanly turn in The Portrait of a Lady. 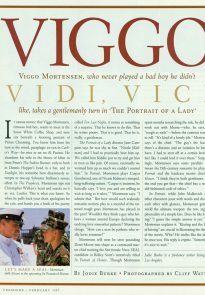 It seems ironic that Viggo Mortensen, virtuoso bad boy, wants to meet at the Snow White Coffee Shop, and now sits beneath a looming portrait of Prince Charming. You know him from his turn as the wired, paraplegic ex-con in Carlito’s Way—he tries to rat on Al Pacino. He abandons his wife in the throes of labor in Sean Penn’s Indian Runner, only to bash in Dennis Hopper’s head in a bar, and in Daylight, his wannabe hero disastrously attempts to one-up Sylvester Stallone’s rescue effort. In The Prophecy, Mortensen rips out Christopher Walken’s heart and snacks on it as, yes, Lucifer. This what you know. So when he pulls back your chair, apologizes for the rain, and hands you a book of his poetry called Ten Last Night, it comes as something as a surprise. That he knows to do this. That he writes poetry. That it is good. That he is, really, a gentleman. Published February 1997 in Premiere magazine. Notes: Jodie Burke is a freelance writer living in Los Angeles. Main photo by Cliff Watts. G.I. Jane photo by Phil Bray.